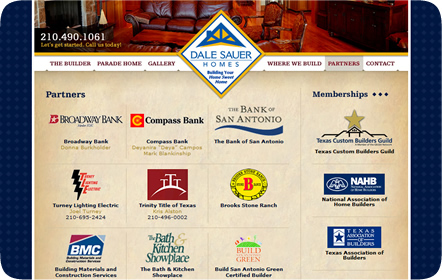 Dale Sauer Homes is a custom home builder in San Antonio that caters to the San Antonio and Hill Country area. As an owner, business and project manager, Dale Sauer personally works with you to ensure your home is built to your exact standards from start to finish. 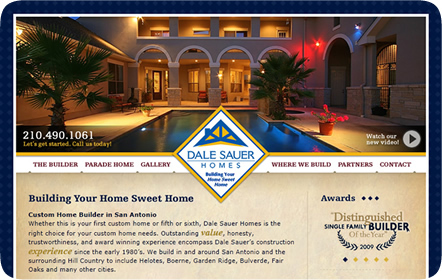 On average, Dale Sauer builds between eight to twelve homes annually and each customer is pleased with not only their home, but the level of quality and service Dale Sauer provides. His homes have won a variety of awards in the past four years and his custom home in Stone Oak was featured as part of the 2011 Parade of Homes. 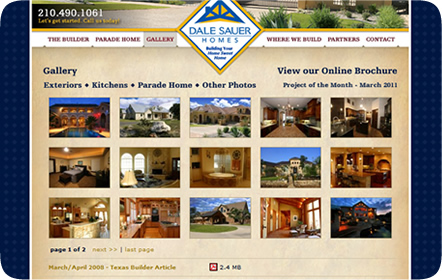 Dale Sauer wanted to feature his fine homes and awards on his website. We included a scrolling text box for his awards and a featured area for his Open House events so the public can visit his homes on the home page. The gallery we incorporated is like taking a virtual tour of his houses, using only the best photography to enhance the user’s experience of his work. The website takes on a rustic, yet elegant look with the use of gold and royal blue as part of the main color palette. 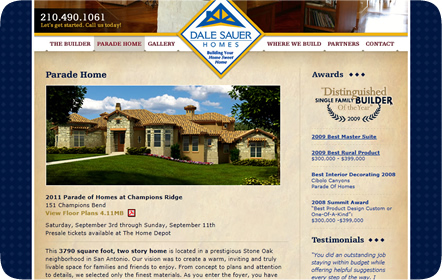 The style we gave Dale Sauer Homes continues to be an integral part of the campaigns we work on. The campaigns and the SEO helps him keep up with other builders online, placing him on the first page of Google.